Not everyone can afford a bespoke suit, or even a top-end ready-to-wear one. But there are many things you can do on any budget to improve the look of your tailoring. If a suit isn’t of the greatest quality, make sure it doesn’t bring attention to itself in any other way. So buy single-breasted, notch-lapel, 2 or 3-button, plain grey or navy suits. Bright colours or patterns might seem like a good option for a cheaper product, but they will only highlight poor materials. A similar recommendation goes for fashions. Watch out for lapels that are too thin, jackets that are too short or trousers that are too skinny. Not only does this bring attention to the suit, again, but it potentially shortens the suit’s life if things become unfashionable or your tastes change. And if the suit only lasts two years you might as well have spent twice as much on one that would last four. 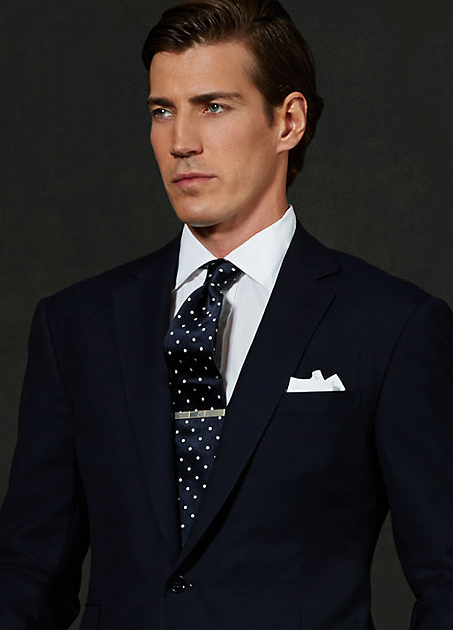 Remember, there’s nothing wrong with a suit that goes unnoticed. Indeed to some students of elegance, good clothing should always do that. One should give the basic impression of being well dressed, but nothing more. Many readers tell me they have been following Permanent Style for years. They often recount the pleasures of investments that accumulate, building up a quality wardrobe that only gets better as good things last longer. I’m sure they would all tell you to buy the best suit you can, and then to plan for longevity. Ways to make your suit last longer include buying two pairs of trousers; brushing it down after every wear; hanging/packing it carefully; only dry cleaning it every 6 months to a year; and not wearing it when you’re raging-steaming-falling-down-oh-there-go-my-legs drunk. I say this all the time, but it bears repeating: find a decent alterations tailor and spend the money to have one or two adjustments made. The jacket should fit on the shoulders and neck primarily, and can then be altered in the body to fit. If there are big issues that affect the overall style of the suit – such as the width of the trousers – this might also be worth spending money on. Again, effectively a way to push the suit into the background. Don’t buy cheap, loud ties. Invest in decent English-made shoes (and look after them properly too). Perhaps find some nice little touches that can be worn every day. A friend of mine wears a vintage watch and his grandfather’s gold cufflinks every day. The first was a birthday present, the second an heirloom. Neither cost him anything, but they elevate his business wear every single day. Such are the pleasures of being a man. You can follow the discussion on How to make a cheap suit look good by entering your email address in the box below. You will then receive an email every time a new comment is added. These will also contain a link to a page where you can stop the alerts, and remove all of your related data from the site. Sound advice as always Simon. Although more of a general comment, I’m always surprised by how many people do up the bottom button on suit jackets – something to be avoided irrespective of the quality of the suit. Absolutely. ‘Sometimes, Always, Never’ for the three buttons from top down, as someone once said. It should be seen as a common courtesy to point this out to people, as well as removing the basting thread on their vents when the shop hasn’t removed it. Or even worse….. The label on the arm. I have seen this more times than I care to remember. I now know that I should go the other way. I buy well fitting at the waist and top of the thigh with regular legs and have the legs re shaped for a great fit. All for about £25. I wish I had known more sooner. I would have saved a fortune. Hi Simon, a quick question if I may. My SR Tailor refuses to do any work on other tailor’s or RTW items. Can you recommend a good alteration tailor in London who will take on this kind of work? Do you know anyone in Oxford? It’s a bit of a hike to London for simple things…. But everyone I’ve dealt with in Oxford has been rubbish. Mostly they seem to be Chinese alterations tailors who struggle to hem trousers. If anyone is based just outside of london or on the outskirts and needs someone, I use Les Groves in Buckhurst Hill, have done for years and I have actually learned a lot from him (see my post above). Former SR tailor ( I believe H. Poole) I have used him for tailoring to casual wear. As a personal preference, Simon, do you keep the jacket pockets stitched shut or do you open them up? I have a relative who insists I should always keep them sewn shut. Said it saved his life once. I guess because the pocket didn’t get caught on something? Thanks for this post. PS, as a blog, could also have as a motto this one: “Learning how to build a good wardrobe while saving money”. Surprisingly enough, it’s true! Great taste and style can compensate for a less-than-spendy suit. Good, timely article particularly with some suit sales currently on. An alteration tip for those considering check or window pane suits; if the sleeves need shortening get the alteration done on the sleeve, not the shoulder. If raised at the shoulder the pattern of checks across sleeve and body will then be out of alignment. Simon might there be other tips that would help the alteration process that you and perhaps Graham Browne might have… they are are always welcome and can save considerable amounts i.e. if using someone new it is a good idea to agree (and note down) proposed changes /new lengths (trouser length for example), so upon return there is no confusion as to agreement or expectation. Typically a cheaper suit will have shiny buttons. Get them replaced with some which have a Matt finish. I’d be happy to give your buttons a “Matt” finish. I’ve seen you are displying pictures of people wearing a tie clip. If I’m not wrong, this website, and your work, is supposed to give people advice and hints on elegance, which is certainly a good aim. If this is it, may I ask why you are encouraging people wearing horrendous pieces of metal? I have SR bespoke and other very fine suits. But at this time of year, when it’s hot at outdoir events, I am thrilled to have two linen suits I bought at H&M(!) a couple of years back. One is black, the other a kind of off-white, almost a very very light beige. Basic fit off the rack was good, a little normal alteration to sleeves and hems and voila! I occassionally mix the two (black trousers with the beige coat, or vice versa) and wear good bespoke shirts with cufflinks, solid grenadine ties and, of course, something a little edgy on my feet (including socks). The suits themsekves cost just $125 each — the rest of the kit many times that — but no one knows and the linen is always stylish and cool. Avoid suits and jackets that have a keyhole buttonhole in the lapel – get one of these and you might well pin a badge that says “cheap ready to wear” on your chest. Hi Simon I always thought you favoured MTM over RTW is that still the case? Granted my question is subjective, I suppose it comes down how much emphasis the individual places on fit & cloth. This advice sounds very similar to that given on an English Cut regarding how to look good on £200; those were the days. Though Mr M goes further and suggests M&S as a good RTW to buy. I know you say that you only recommend those you use but for us poor proles who can’t afford bespoke it would be good to get some ideas. For instance I was on Jermyn St last week and bought a suit from Daks which after fitting by a local tailor will look good. While there I spotted some jackets that must have been made by an Italian company whose initials begin with LP only at 2/3 of the price they charge. I bought one. Yes, problem is it’s hard to give specific recommendations on the high st. Better to know how to identify a good suit. Trinity Cambridge would be nothing to boast about. Now Oxford…. It’s probably worth resisting the temptation to avoid asking others what they consider to be good ready to wear and focusing on what fits you best. The quality of the fit is what will determine whether the suit will look good on you or not. A well fitting suit from Lewin or Marks and Sparks is going to look better than a poorly fitting Gieves & Hawkes RtW costing 5 – 10 times more. Last time I was in the market for a RtW suit, I spent a Saturday afternoon trying jackets on and then went home and did a bit of research to see what others thought of the construction, durability, etc. I’ve started reading your blog recently and am finding extremely useful with suggestions on style, combining, building wardrobe, and making way through all the makes. I’ve got a question which I haven’t found addressed on sales. You made a few posts on winter sales, but none on summer ones, or my search is bad. Namely, I’m staying in London three more weeks (study visit for work) and was hoping to profit from what I heard was a decent summer sale on all clothing. But I’m unable to find out when this will start, what the reductions will be, etc. Do you know when this will begin and how long I should wait? I’m looking to buy at least one suit (classic medium grey, as my old one has aged badly), which I would probably go RTW due to budget, and at least one pair of good English-made Oxfords in black and hopefully one in darker brown. I’ll also need some shirts (will go for CT which I know and like or try TMW) and maybe a summer/spring/early autumn jacket (it’s warm where I’m from most of the year), and maybe even a Barbour jacket if sale is 50%. My budget is really constrained for my desires, between 500 and 1000 I’m afraid at most. What would you suggest? Wait for the sale (I’m here until early July)? Prioritise? Indeed they were old, didn’t really check the dates. Thak you! Theres no reason ever to buy a cheap suit , just wait for the Saville Row label suits at Marks and Spencer to go down in the sales (they always go down to about 100-150 ) and are good material and very well made so the cheap suit idea doesnt. I would also consider the Threadneedle tailor at the Elephant and castle who is as good as anything on the continent or in Saville Row and will cost 350 bespoke if you take the material . So really no one has to buy a cheap suit or go without bespoke . I have about 6 bespoke suits made by Italian tailors and about 5 saville Row M and S suits , the M and S suits are always liked more by people in Italy . Dear Gary, thank you for this advice! Gary, do you know if the tailor in Elephant and Castle has a sale also? I mean, £350 is a bit exhorbitant for bespoke innit? Longevity and two pairs of trousers. How long do we want our suits to last? Do we really want to be wearing the same old suit in two, three, four or more years? When does boredom set in, and who has infinite space to keep their old suits after new suits are purchased? Even subtle fashion changes can make suits of just a few years old stand out for the wrong reason. I don’t really buy into the longevity argument or that of two pairs of trousers to get more life out of a suit. So buying cheap and often is not such a bad idea – as long as the fit is correct. I want my suits to last a good 10 years – and so far all bespoke ones have. I have about 20 suits , bespoke , made to measure , and top range saville row label from M and S . If you wear a different one every day then of course they will all last twenty years . If we are talking cheap suits I suppose in the Uk you are talking Primark or Topman or the like . Who buys them anyway? Kids? I have actually had a really good experience with suit supply. There seems to be a big range of pricing from about £250 – £700 and at all levels there is no fusing etc. I bought a 110 VBC clothed canvassed navy suit for about £360 and with alterations just over £400. the alterations are done in house so are quite reasonable. given the fact i know i would need more alterations on a M&S suit and it would be fused i think this is amazing value compared to anywhere else. i don’t think you could get better value on the (sort of) high street without jumping on a plane to Hong Kong and getting it made there. they will also do MTM or Made to order if required at an amazing price. Very possitive experience with them. They may sway to the slimmer fits but they do all seem to have a good understanding of fit in the store. I’ve just come across your excellent website. I’ve recently moved to Sutton Coldfield and am unfamiliar with the area. Do you know of any respectable quality alterations tailors that you could recommend? Thanks. Great article. Your point about wearing good shoes deserves it’s own separate point at the top. Would love to see more on accessories. You may even get more ads from watch companies!